Rothbury: The Armstrong memorial cross. Dr Tony Power, has co-authored a paper in York Historian 33 based on the recently discovered Day Book of the York based sculptor George Walker Milburn (p219 A&C in NE and p311 A&C in Yorks). The paper is a wonderful introduction to the vast amount of work undertaken in the region and elsewhere by this much underrated artist craftsman. Amongst many other things the article makes it clear that Milburn was responsible for the carving, designed by C.C. Hodges, for the Armstrong memorial cross in Rothbury. Dr Power is working on a biography of G.W. Milburn which will surely throw a bright light on a career overshadowed now by such contemporaries as Robert Thompson, James Ellwood, Ralph Hedley, Bridgman and the Bowmans. 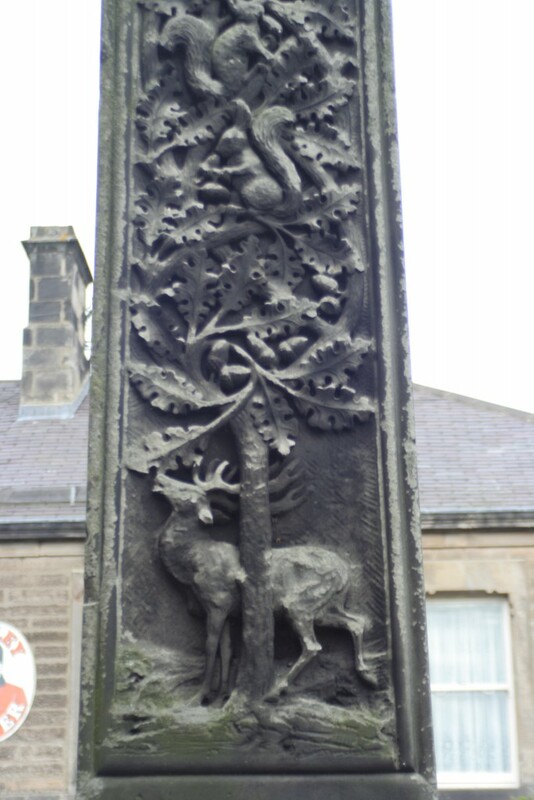 A panel of the Armstrong Memorial cross, Rothbury. Designed by C.C. Hodges, Executed by G.W. Milburn, 1902. Here is an addition to the Northumberland section of the gazetteer. Howick, St Michael and all Angels Parish Church in the grounds of Howick Hall. Chapel of St John the Baptist at Matlock Bath: Louis Davis stained-glass window. We recently visited the Chapel of St John the Baptist at Matlock Bath which is in the care of the Friends of Friendless Churches. This little stone-built chapel with its brick interior was designed c.1897 by Guy Dawber (1861-1938) for the widow, Mrs Louisa Sophia Harris, who paid for the project as a memorial to her dead husband. It was the only church Dawber designed. 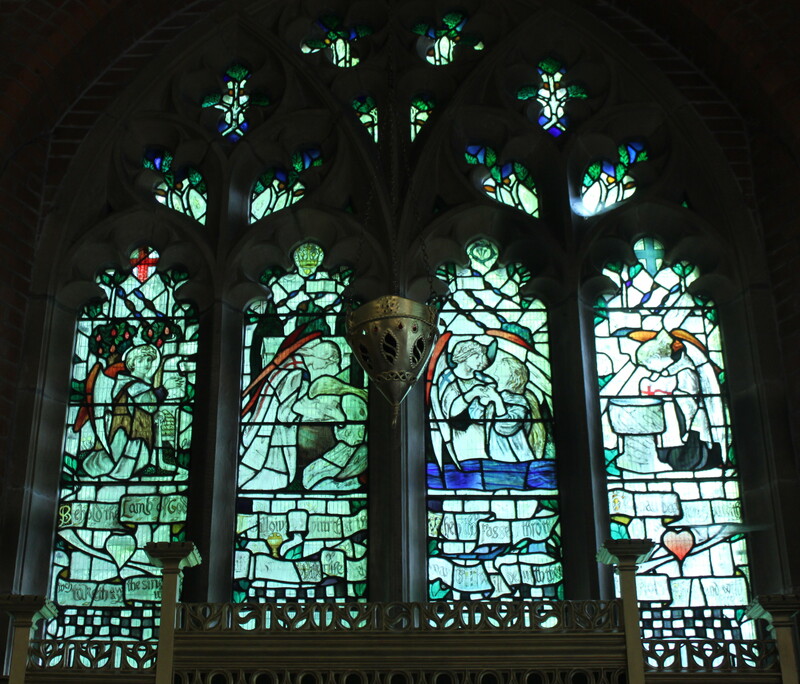 Apart from its picturesque appearance and sylvan setting, the church is worth a visit for the sake of its interior decoration by two of the Movement’s most talented artist/craftsmen. 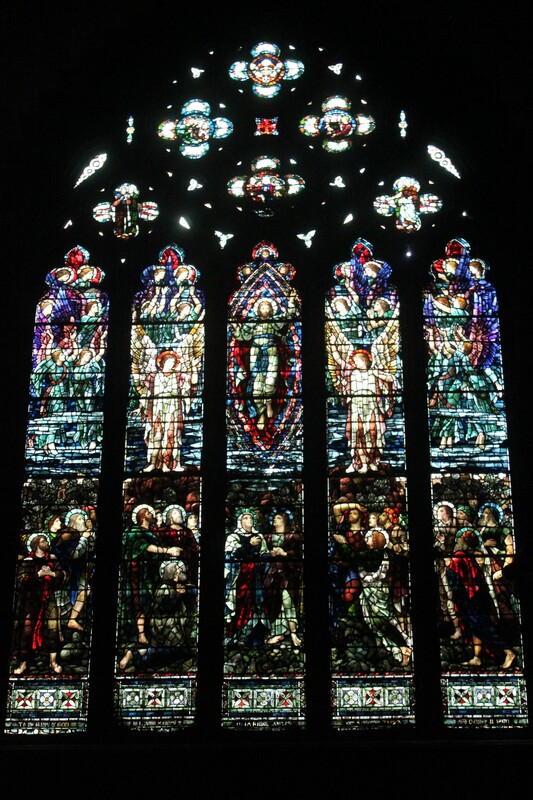 The east window was designed and made by Louis Davis (1861-1941). It is shown below with apologies for the poor quality of the photography …. it was not a good day for it!! 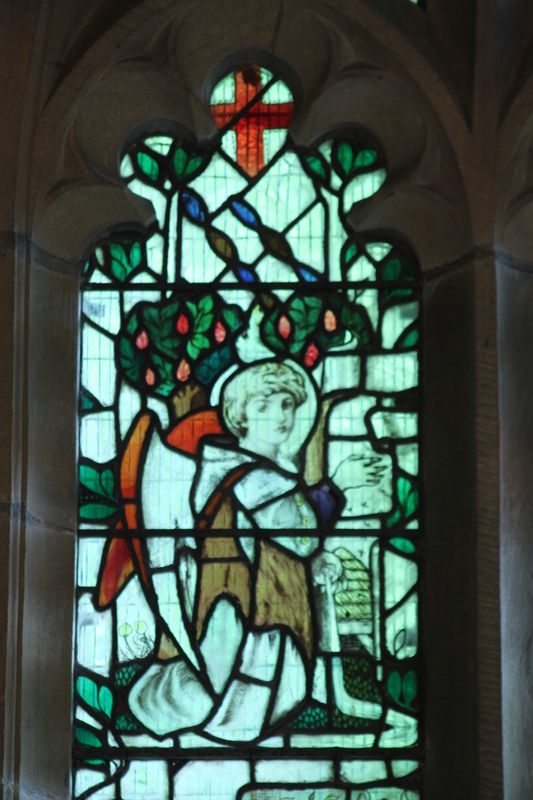 Nevertheless, Davis’s drawing style and general treatment are very recognisable in this window. There are very few examples of his work in the North. We have only found his windows at Rossall School at Fleetwood in Lancashire and in the memorial chapel at Wynyard Hall in Teesside. We think that is a bit remarkable given the popularity of his work in the South of England and in Scotland. The barrel- vaulted chapel ceiling has a frieze and moulded-plaster ribs with painted wreaths of stylised plant-forms by George Bankart, (1866-1929) . Most of the interior fittings were designed by Guy Dawber and the very competent carving with some quirky decorativre features is attributed to the less well-known Cecil Fabian. There are also some glitzy mini chandeliers. 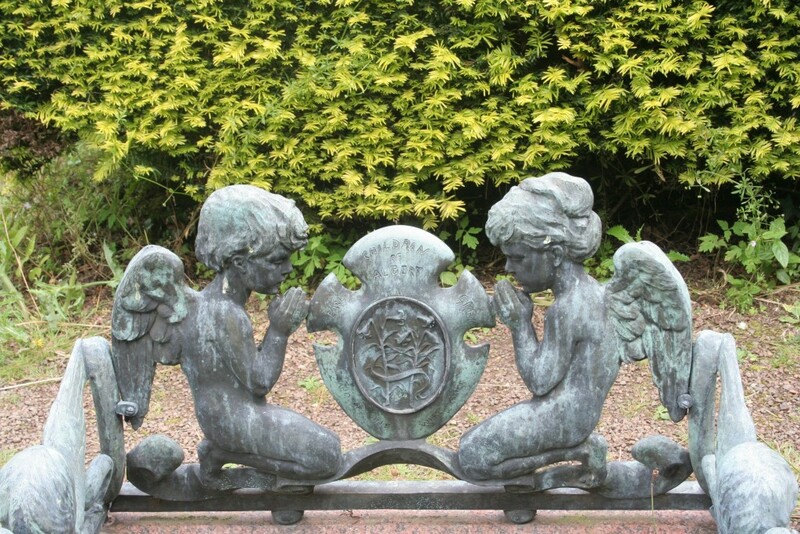 Whilst they are unattributed, they are reminiscent of those designed by George Jack for the church of St James and St Basil at Fenham, Newcastle upon Tyne. On the other hand they might just be by W.A.S. Benson. Access to the church can be a bit difficult if you decide not to leave your car in the car park to the east of the A6 just beside a Matlock Bath sign and opposite the very narrow and quite steep, St John’s Rd. You can drive up with care but be VERY careful doing your 7 point turn at the top of the road before coasting down to the one-car only space by the entrance gates. The church is usually locked up but, the web site www.friendsoffriendlesschurches.org.uk provides a telephone number to call for information about contacting keyholders … 02072363934. It is always worth checking at HQ before you travel to any of the Trust’s churches.